Carley Rusch, MS, RDN, LDN graduated with a B.S in Food Science and Human Nutrition from the University of Florida. She went on to complete her internship through the UF Master of Science and Dietetic Internship program. During her time as a student, Carley worked four years as a research study coordinator in the lab of Dr. Bobbi Langkamp-Henken where she helped facilitate clinical trials investigating pre- and probiotics and their role on gastrointestinal and immune health. She has been a co-author on publications related to health benefits of fiber and probiotics. 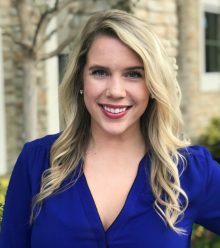 After becoming a Registered Dietitian Nutritionist, Carley has spent the last 2 years working as a clinical dietitian in Orlando, FL primarily in the role of oncology and nutrition support. Carley is excited to come back to UF to work towards a doctoral degree in nutritional sciences while facilitating an innovative nutrition program within the Department of Neurology through advanced nutrition care and research. Her research focus will be related to the role of diet and gastrointestinal health in Parkinson’s disease.